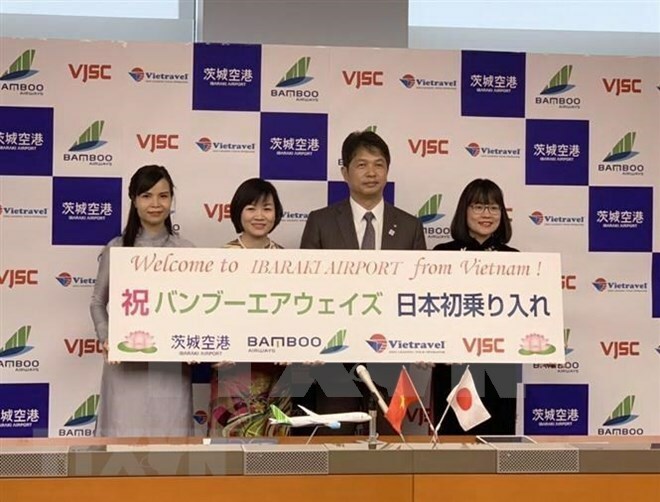 Tokyo (VNA) – Vietnam’s newest carrier Bamboo Airways said on April 5 that it will start operating charter flights to Japanese prefecture of Ibaraki during the Golden Week in Japan. At a press conference the same day in Ibaraki, a representative from the airline said it will operate daily charter flights using Airbus A321 Neo aircraft from April 28 to May 2 from Vietnam to Ibaraki airport and vice versa. Deputy Director General of Bamboo Airways Duong Thi Mai Hoa said the launch of flights to Ibaraki is due to the locality’s hosting of many tourist sites and its close proximity to Tokyo, which are expected to attract a lot of Vietnamese tourists. She hoped the route will create a momentum to boost the cooperation between the Japanese prefecture and Vietnamese localities as well as the economic ties between the two countries. At first, the airline will run charter flights and will later study to open regular flights to Japan when travel demand is rising in a stable manner. Governor of Ibaraki Kazuhiko Oigawa said the launch of the air route to Ibaraki by Bamboo Airways will create a good opportunity for the province to further enhance its relations and exchanges with Vietnam. Coming to Ibaraki, visitors will have a great chance to visit a number of popular sites such as Kairakuen garden – one of the three most beautiful gardens in Japan, Hitachi Seaside Park – one of the best places in Japan to view flowers all year round, and Ushiku Budda – the world’s largest bronze statue. According to Bamboo Airways, besides Ibaraki, the airline plans to open more charter flights to other Japanese prefectures such as Okinawa, Fukushima and Wakayama. In the long run, it will develop regular flights between Vietnam and Japanese urban centres.